Jesse Owens is perhaps the greatest Olympian of all. The black American won an unprecedented four track and field gold medals at the Berlin Games in 1936. He achieved the feat under the steely glare of the Führer Adolf Hitler, who had wanted Germany's first Olympics to demonstrate Aryan racial superiority. By the end of the 1936 Games, the people of Berlin had rejected the Nazi propaganda and hailed Owens as their hero. It was not the first time Owens, the son of sharecroppers and the grandson of slaves, had overcome racist bigotry. While at Ohio State University, he had been forced to live off campus with other African-American athletes and, when he travelled with the team, Owens had to eat at 'blacks only' restaurants and sleep in 'blacks only' hotels. A year before the Berlin Games, Owens had proved himself to be an outstanding athlete. At the Big Ten meet in Ann Arbor on 25th May 1935, Owens equalled the 100 yards world record of 9.4 seconds, shattered the long jump world record by 15 centimetres with a leap of 8.13 metres, cut 0.3secs off the 220yds world record in 20.3secs and slashed 0.4secs off the 220yds low hurdles world record in 22.6secs. 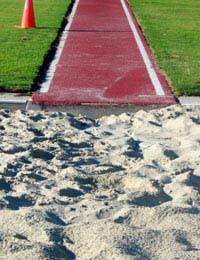 His long jump record lasted 25 years until broken by fellow American Ralph Boston in 1960. Two months before the Games, Owens added the 100m world record to his collection. His time of 10.2secs stood for 20 years. More records fell as Owens, born James Cleveland Owens on 12th September 1913 in Oakville, Alabama, chased gold in Berlin. He won the 100m in 10.3secs, lowered the 200m Olympic record to 21.1secs in the heats and then went 0.4secs faster to win the final, and won the long jump with 8.06m, an Olympic record that lasted 24 years. The decision of Avery Brundage, president of the US Olympic Committee, to pick an all-white team for the 4x100m relay looked to have robbed Owens of the chance of a fourth gold medal. However, the threat posed by the Dutch team forced the Americans to rethink, so Owens and Ralph Metcalfe, runner-up in the 100m, were included alongside Frank Wykoff and Foy Draper. The USA, with Owens running the leadoff leg, won in 39.8secs, a world record that stood for more than 20 years. One athlete who can legitimately lay claim to the title of greatest Olympian ahead of Owens is the man who emulated him 48 years later. Carl Lewis, inspired by Owens' granddaughter carrying the Olympic torch into the stadium during the 1984 opening ceremony in Los Angeles, matched what Owens had achieved in Berlin. Lewis won the 100m by two-tenths of a second in 9.99secs, the 200m in an Olympic record 19.80secs, the long jump by 30cm with 8.54m and the 4x100m relay with Ron Brown, Sam Graddy and Calvin Smith in a world record 37.83secs. Four years later in Seoul, Lewis retained his 100m title in a world record 9.92secs after Canadian Ben Johnson had been disqualified for drug use, and also his long jump title with a leap of 8.72m. He took silver in the 200m. At the Barcelona Games in 1992, the America won a third long jump title, defeating world record holder Mike Powell by 3cm with 8.67m, and regained the 4x100m relay title with Michael Marsh, Leroy Burrell and Dennis Mitchell in a world record 37.40secs. His ninth and final Olympic gold medal came with a fourth consecutive success in the long jump, thanks to an 8.50m leap in Atlanta. Lewis is one of only four Olympians to win nine gold medals - the others being Finnish distance runner Paavo Nurmi, American swimmer Mark Spitz and Soviet gymnast Larisa Latynina - and one of only three to win the same individual event four times alongside American discus thrower Alfred Oerter and Dane Paul Elvström, a single-handed dinghy sailor. In a glittering career, Lewis also won eight gold medals at World Championships, held the 100m world record twice and was a member of 4x100m relay world record-breaking teams five times.